It’s great seeing new places spring up. In the last couple of months, a new restaurant and a café have opened where Caroline lives, in the west of the city. Over at the other end in Leith, where Amy lives, there are other interesting developments. A steakhouse and cocktail bar on Constitution Street it is not far from other venues on the same street and the Shore. One sunny day in September, soon after it opened, Amy and Caroline went to visit. We started our afternoon in the bar, talking to Michael, the bartender. He has devised a number of interesting cocktails that we were keen to try. 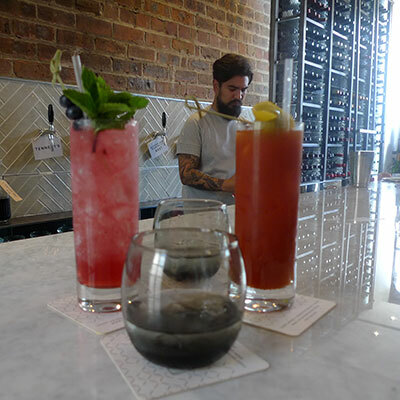 Since we were in for lunch, he recommended cocktails that sit on the savoury end of the scale: a Bloody Mary infused with mushrooms, and a Blueberry Shrub. In this context, a shrub is a cocktail that contains sweetened fruit vinegar as well as spirits. Behind us, a wall topped with slanted glass panes separated the bar from the restaurant. The restaurant is clean, cosy and modern. If you get the right seat you can see the dry-aging cupboards, where magic happens. It’s an impressive – and tempting – sight. 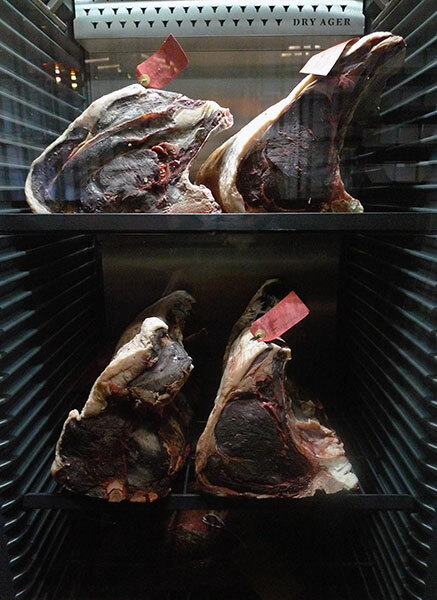 Provenance and quality are important to Leith Chop House and it’s rather lovely that the ageing process, that which gives the meat its final flavour, is so relatively public. Michael has developed a number of interesting new cocktails as well as Chop House’s own beer. When was the last time you had corned beef? It doesn’t have to be a bright-red mass of fibres encased in white fat. 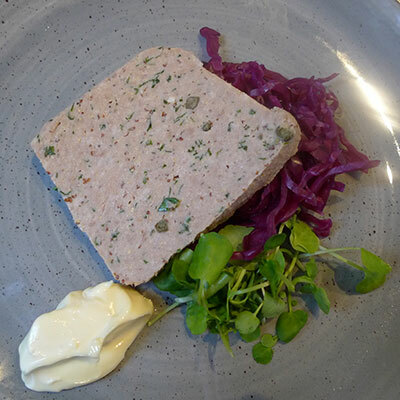 Leith Chop House proved that it can be something quite delectable, thankfully nothing like the granular tinned stuff Amy recalled from childhood; this was more a rilette than a horror. It was served with a pleasant although not-so-fiery horseradish mayo. Crunchy, tangy pickled cabbage contrasted nicely with the beef’s smooth texture and meatier notes. Corned beef with tangy cabbage. Yummy! 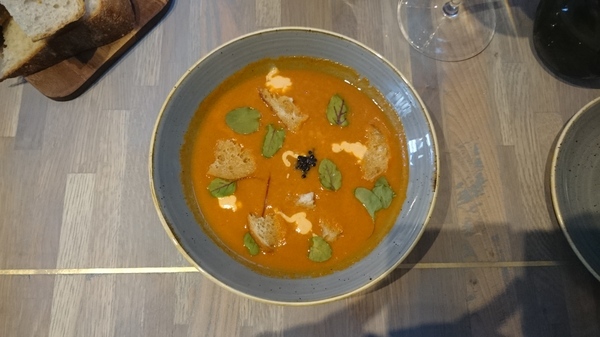 The lobster bisque was a little too rich for Amy’s tastes, but it was nonetheless luxuriously creamy, punctuated by bursts of saltiness from caviar and a coarse savouriness from soaked croutons. A vivid orange, it was beautifully presented and excited all the senses like a good starter should. We had a side of bread and bone marrow butter with the starters too. The butter was magnificent, full of rich bone marrow, fresh with green herbs and warm with pink pepper corn. The corned beef was great spread in thick smears across the lightly toasted bread. Did we want to try the chateaubriand? Yes, please! 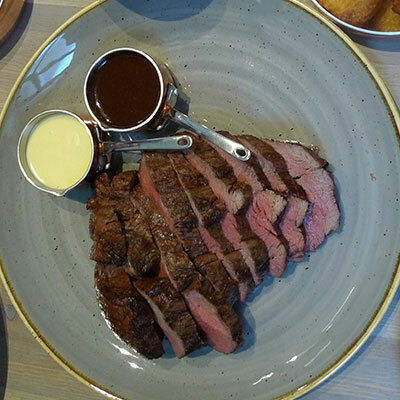 Chateaubriand is a sharing cut, sold by weight. They’d sold the last 500 gram fillet, so we got a 700 grams one. It was a good size for two hungry (/greedy) bloggers. 900 grams would have been far too much. The meat was superb – all that dry aging and hanging for months was absolutely worth it, carrying through to give a distinct flavour which reminded you why supermarket meat is a waste of time. The dry ager is doing its magic. 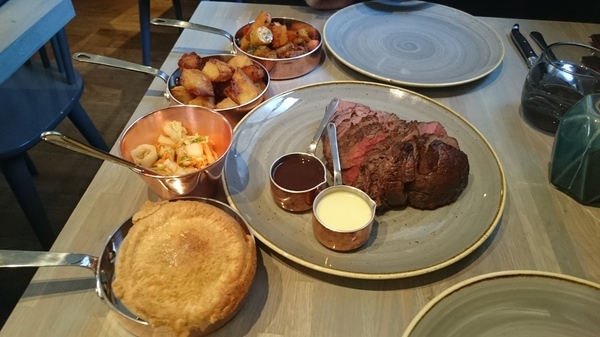 The fillet is cooked to your specification and served rested and sliced with all the trimmings: big Yorkshire puddings, gravy, horseradish sauce, proper crispy-edged roast potatoes and herby roast root veggies including heritage carrots. Amy found that for so much meat the amount of gravy was lacking, but that was easily remedied. To complement the delicate flavour of the meat, we ordered a “curveball” side of kimchi slaw. We both love kimchi: it’s heat and slight funkiness is lovely combined with well-aged beef. 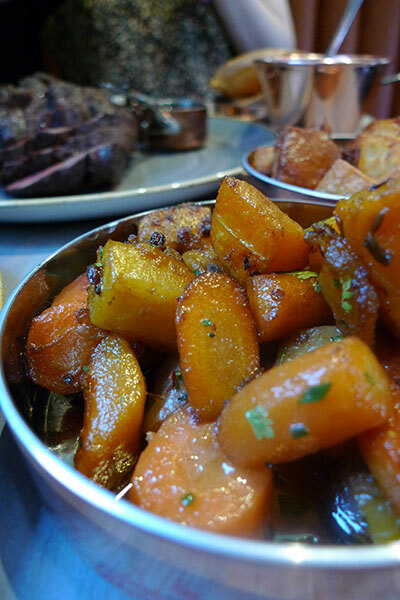 Roast veggies in the front, tatties and beef in the back. It’s always difficult to chose between sweet and savoury deserts. Good thing EF reviewers are happy to share, so we can try both. The 3-piece cheese board was served with some rather good bitesize homemade oatcakes. 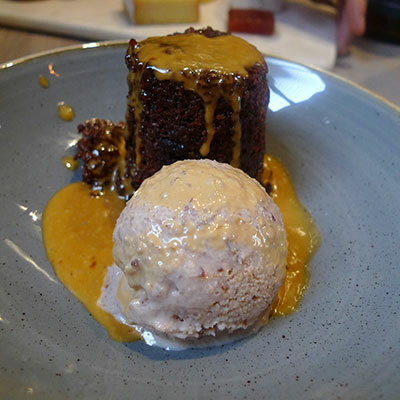 The sticky toffee pudding was fluffy and light with a moreish treacly flavour, served with an intensely sweet sauce and a rather interesting pecan ice cream. 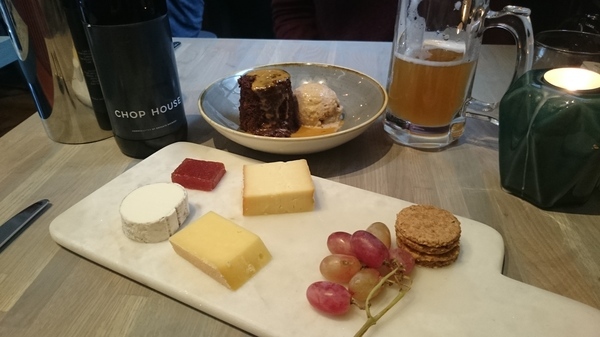 Cheese board and sticky toffee pudding at the back with some official Chop House lager. As a local we both felt it would make a great choice for a cocktail before heading into town, or for a fancy boozy brunch with friends. We’ll be back. Light and fluffy sticky toffee pudding, delish pecan ice cream. Like Leith Chop House on Facebook. Follow Leith Chop House on Twitter. Find Leith Chop House on Instagram. Caroline and Amy ate & drank at Leith Chop House’s invitation.